Manny Pacquiao has voiced his disappointment at the wild brawl that broke out at the basketball game on Monday between the Philippines and Australian national teams at the FIBA Asian qualifiers at the Philippine Arena in Bocaue, Bulacan. “Basketball should be played the way it should be played,” the hoops fan and former eight-division world boxing champion told the Manila Times. “While oftentimes games turn physical, basketball is unlike boxing or martial arts disciplines where violence is sometimes the rule rather than the exception. “In boxing, protagonists touched gloves at the start of the match after the referee had reminded them to fight clean and fair. When somebody falls, we even help him stand up. Hitting him while down is taboo and there is point deduction for each violation. “We even hug each other after the fight, to remind us that we’re both human, thank each other for giving the fans enjoyment. 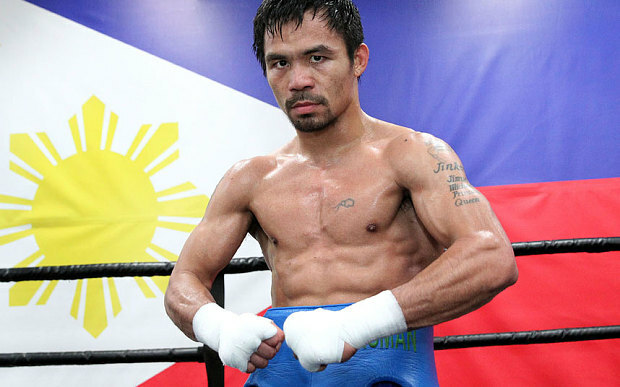 Meanwhile the 39-year-old Pacquiao continues to put the finishing touches on his preparation for his July 15 world title tilt when he takes on WBA “regular” welterweight titleholder Lucas Matthysse of Argentina at the Axiata Arena in Kuala Lumpur, Malaysia. Australian sparring partner and world-rated lightweight George Kambosos Jr says that the Filipino senator is getting faster with every sparring session. The fight will be Pacquiao’s first since losing his WBO welterweight title to Australian Jeff Horn at Brisbane’s Suncorp Stadium one year ago.